Personalised Calendar A3 Landscape. Go large and landscape. 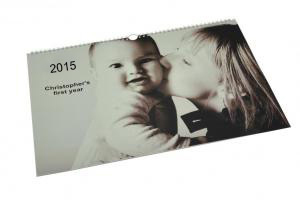 Making a calendar is simple and fun with our easy-to-use, free software. Transform your best landscape photos into a glorious A3 calendar, ideal for your home or office. Personalise every month with a wide range of free backgrounds, special effects, lay-outs and clip-art graphics designed to enhance your photos and show them to best effect. Wire bound in white with a hanging loop, your photo calendar means your photos of family and friends can cheer you up every day of the year. Remember, you can make your calendar starting on any month of the year, so it’s a great gift idea for Christmas, birthdays and special occasions. Size: 420mm x 297mm. Paper: Printed on 250gm gloss photo paper. 01992 534 266 or 0207 607 3361. I understand that by ticking this box and submitting this form, I consent to BookBinders Of London contacting me by email or phone in order to process my enquiry. Bookbinders Of London will not pass your details onto other companies or third parties. 33-37 Chambers Street, Hertford, Hertfordshire, SG14 1PL, United Kingdom. We are open 5 days a week and our opening times are below.